The WSK Final Cup in Adria opens with a brilliant success in OKJ class of Gustafsson. Next to this victory, there is also Vidales’ podium in OK.
OKJ. Viktor Gustafsson’s performance was always better and our driver made the most of the heats in the 26th position, recovering sharply after a difficult qualifying (57th). In the B prefinal Viktor already laid the basis for a winning final, gaining more ground and closing seventh, on dry track. In the final, our young Sweden driver has taken advantage of the perfect set-up of his Tony Kart-Vortex chassis and shown a remarkable driving expertise. This became clear on the seventh lap, when Viktor completed his comeback, overtook Brizhan (Tony Kart-Vortex) and escaped, unmistakable, to a spectacular victory. Along with the results of the first round, Gustafsson is also the leader of the provisional ranking, with 56 points. OK. David Vidales conquered a positive podium, after having run the whole weekend in the top positions. Our Spanish was second in qualifying, fourth at the end of the heats and second in the B pre-final. 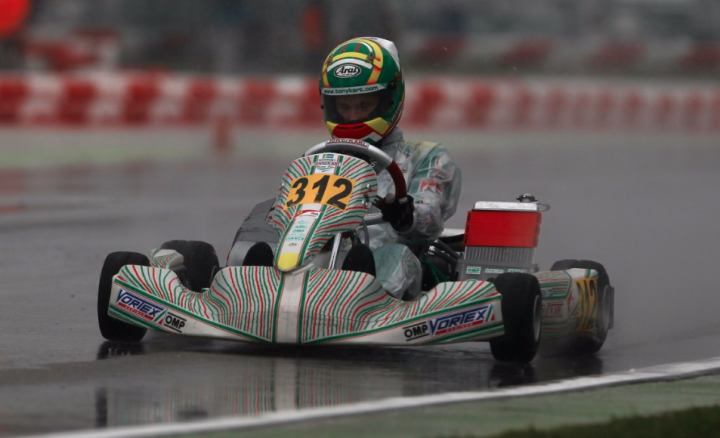 The final took place on the wet track and David had to fight against the most rivals at the wheel of Tony Kart Vortex chassis, among which there was Nielsen (KSM Schumacher Racing Team), who finished second. MINI. Andrea Antonelli gained the third position in the final grid, thanks to a success, top rankings during the week and a second place in the A pre-final. At the start of the final, on the wet track, Andrea incurred in a collision who took him to the bottom of the line, forcing him to a difficult comeback. The final in the Mini class saw the predominance of two Tony Kart chassis, Bedrin and Fomin’s (Baby Race Academy), who took the first two positions. Already on next Sunday, Antonelli, will have the chance to revenge, with the second, final, round of the WSK Final Cup.